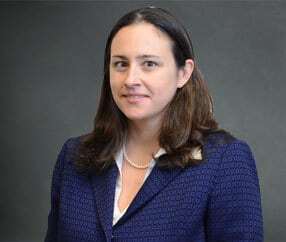 Dr. Stacey Wood, Ph.D., is a forensic neuropsychologist and one of the nation’s leading experts on financial elder abuse and fraud. Her rich experience as a researcher, clinician and in the courtroom make her an ideal addition to your legal team’s next case. CV / Contact Now. The 2017 AARP Investment Fraud Vulnerability Study highlights two troubling trends in the United States. Investment fraud is on the rise and elders are increasingly being targeted. This article extends the AARP’s discussion on elders as investment fraud targets, exploring common schemes, a discussion on why seniors are vulnerable, and methods for prevention and resolution. In preparation, we spoke with a number of elder abuse advocates, elder abuse attorneys in California, financial abuse researchers, and contributors to the AARP Study. It’s clear that investment fraud cases are on the rise in America. The Federal Trade Commission’s Consumer Sentinel Program, a central repository for fraud complaints in the U.S., reports that complaint volume has increased 60% in the last five years (FTC Consumer Sentinel, 2016). The Commodity Future Trading Commission (CFTC) has likewise reported a huge increase in the number of enforcement actions it has taken, imposing a record of 3.14 billion in civil monetary penalties in 2015 alone (CTFC, 2015). The US Securities and Exchange Commission has increased the number of investment fraud prosecutions they bring by approximately 15% per year since 2014 (SEC, 2016). The AARP Study indicates that elders are at a disproportionate risk for being victimized. According to AARP and the FINRA Investor Education Foundation: investment fraud abuse victims tend to be older, male, more financially literate, more educated, have higher incomes and are more open to sales situations than the general public. Additionally, 50% of investment fraud victims were over the age of 70 compared to general investors (35%). Within the AARP Study data, there are a few key findings that may explain why elders are being targeted more often than the general population. Older citizens are more often victims of fraud than the general population. 51% of fraud victims surveyed were over the age of 70. Additionally, 38.3% of investment fraud victims were between the ages of 50-69. With nearly 90% of the victims of investment fraud being 50 or older (eligible for AARP), it’s clear scammers prefer a specific subset of the population. Scammers are looking for receptive ears and the path of least resistance to execute their con. This article looks more extensively at the psychological factors that may influence this statistic later, but an anecdotal theory from this data is that scammers understand their audience and are going after receptive ears. For business, salespeople are often given a ‘customer profile’ that provides detailed information on who their ‘perfect customer’ is. It’s likely that scammers employ the same strategy to employ their time most efficiently and execute the most cons. Fraud victims are more open to remote investments than the general population. Being able to pitch investment opportunities and conduct operations away from the target in relative anonymity affords the scammer a layer of protection. Elder citizens, with a higher proportion being retired and available during a given business day leaves them vulnerable to predation. 58% of fraud victims in the AARP Study reported receiving at least investment sales telephone call each month compared to 32% of general investors. 53% of investment fraud victims reported receiving a solicitation via email compared to 35% of general investors. Outside of any psychological factors, simply being in the right place and right time more often than younger investors (at home) may lead to more elder investment fraud. Investment fraud victims believe “the most profitable investments” are not regulated by the government in a higher proportion than the general population. Since we have established that an overwhelming majority of investment fraud victims are above 50, the mindset findings from the AARP study are particularly troubling for financial elder abuse advocates. Investment opportunities outside of government regulation provide scammers with more protection against transparency and an easier path to complete the con. It appears that elders hold this belief more consistently than the general investing population that has not been victimized. ‘The Lost Ground’ mentality and the chasing better returns. Interestingly, in victim surveys, the AARP found that they “believe in taking chances with one’s money if those chances are likely to pay off. Victims are willing to take risks to make money even AFTER they have been taken. “60% of fraud victims surveyed in the study agreed that acquiring wealth was an important achievement in life. This willingness to engage in additional risky investments after already being victimized was a unique characteristic of the investment fraud victims, who 90% of which were above 50. An openness to sales pitches, unlike other investors. A key finding in the AARP Study was that investment fraud victims were more open to hearing sales pitches than the rest of the of the public. The fact that many more victims have a mindset of openness to sales pitches, they are signaling to the investment brokers out there that they wish to be pitched. For professional scammers, making hundreds of calls a day, it becomes easy to identify your ‘perfect customer’. These subtle signals being offered by elders have clearly not been lost on unscrupulous individuals seeking to steal money. As you might expect, shady investment sellers are looking for people who will “play ball” and seek a “special” opportunity that the general public doesn’t have access to. This mentality, according to the AARP study, appears to be more prevalent in elders. Researchers in the study notes that they possess a good sense of who is the most vulnerable to elder abuse, but there is still much to learn about why people fall prey and how it can be avoided. In order to better understand the problem, it may be helpful to understand the distinction between typical financial elder abuse and elder investment fraud. An example of California elder financial abuse was the deadly case of Jamaican lottery scam that ended in a murder. Earlier this year, Heidi Muth, a 68-year-old retired teacher from Southern California sadly lost her life after flying to Jamaica to claim a nonexistent financial prize. These scams are prevalent, have recently been a focus of FBI crackdowns and work by manipulating the elder individual to invest a smaller amount of money in order to pay taxes or some sort of processing fee in order to claim the ‘big’ prize. The scammers operating out of Jamaica have received the most attention lately, but there are many variations of this “pay a little now, get the big payoff later” scam coming from multiple countries. Excessive trading by a broker in a client’s account for the purpose of generating commissions for the broker. Churning often results in losses for the investor and also brings the risk of generating tax liabilities. The allure of quick cash has blinded mankind since the creation of currency and the promise of enormous returns at little cost is often enough to woo under-informed investors. The simplest form of investment fraud, lying to those you owe a fiduciary duty to or, lying about your credentials and ability to handle an investor’s money. Bernie Madoff put the term “Ponzi Scheme” into the general lexicon and despite the increased awareness of the con to the public at large, these are still among the most popular investment fraud schemes perpetrated today. Seniors are particularly susceptible to investment fraud scams and many of the people taking advantage of the elderly in this fashion happen to be their own family members, often doing so by gaining power of attorney over the financial affairs of the elder family member and then siphoning off their assets for the abuser’s own gain. This is a particularly nefarious form of investment fraud because often the familial connection insulates the abuser as the defrauded party does not wish to believe ill of their loved ones. 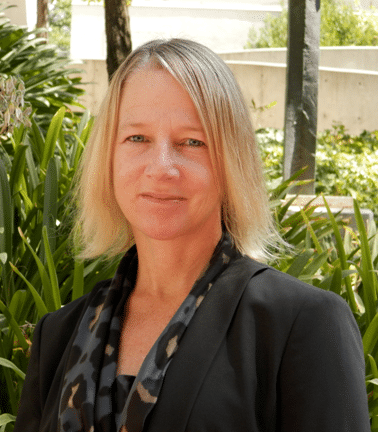 Dr. Stacey Wood is a professor of psychology, researcher and active expert witness on cases involving elder abuse in California. 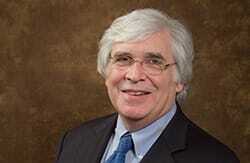 The AARP study highlights the increase in investment fraud particularly among older adult men. Scams often prey on psychological vulnerabilities that include the deep needs of the victims and other factors we associate with aging. Our identities as individuals continue to develop as we age. Aging can present opportunities and challenges to our sense of self, with most individuals eventually obtaining a balance between maintenance of the self and accommodation to changes associated with aging. For others, acknowledging this changes is painful (can no longer run a 5k) and there is resistance to accommodating these changes. In our lab, a working hypothesis regarding scam victimization refers to the desire to continue a “personal fable”. In this fable, we can shore up elements of our identity that may be challenged, and serve as the hero/heroine of our personal narrative. Scammers are remarkably adept at identifying these needs and exploiting them. Let’s take the findings from the AARP study regarding the prototypical investment scam victim who is older, male, conservative, more likely to be a veteran, open to risk and equates wealth with success. These men are not only male but appear to have adopted very strong masculine gender role socialization. These traits align with a strong “masculinity” script that often values traits like “breadwinner”, “winner”, “independent”, and “fearless / risk-taking”. At the same time, these men are aging and may be experiencing some challenges to this role. The potential to have a big win is alluring not only because of the financial reward but because it would reinforce these core aspects of their identity. It is interesting that the victims do not seem to be primarily motivated to be meeting financial needs (just as happy with finances, decent incomes as non-victims). Also, commonly assumed explanations such as “boredom” and “loneliness” do not always differentiate victims and non-victims and point to a need to move beyond simple often ageist assumptions regarding scam susceptibility. We also know that certain factors that are commonly associated with aging increase an individual’s vulnerability to persuasion including mild cognitive impairment, declines in independence, medication effects, poor sleep, isolation, and sensory impairment. In summary, scammers may exploit some age-related declines in vulnerable victims and/or identify psychological needs in otherwise healthy seniors. Before we dig into the actions available for elders who were victimized by a remote investment seller, let’s discuss family elder financial abuse. In our discussion with Mr. Moran, he made it clear that it’s often easier to prosecute to financial abuse as opposed to other types of elder abuse because of the paper trail associated with the crime. Focus on identifying special purchases, trips, or otherwise suspicious activity by the family members in question. Following the money trail where the stolen proceeds may have been used is the clearest path for prosecutors to build a case. Even though it can be difficult pursuing legal action against family, sometimes it’s the only means of recovering assets that are vital to a victim’s life. 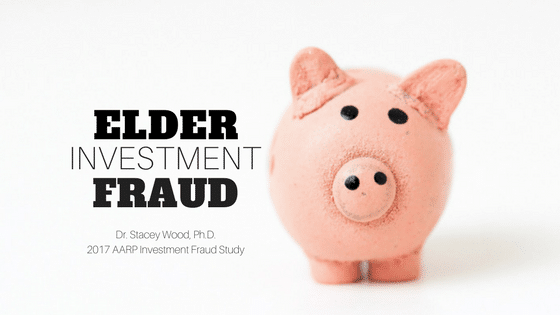 Although run-of-the-mill financial fraud of elders may be the most commonly occurring crime currently, the insights from the AARP Investment Fraud Vulnerability Study show that investment fraud is on the rise. We spoke with two California elder law attorneys with significant experience representing elder victims, Anne Marie Murphy and Michael Hackard to better understand how elder investment fraud victims can obtain legal relief. 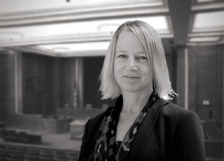 Anne Marie Murphy is a Principal at Cotchett, Pitre & McCarthy LLP in San Francisco, California, where she practices civil litigation with extensive experience litigating elder abuse cases (including both financial abuse and nursing home abuse). Pursuing a court action against an agent who is registered with the Financial Industry Regulatory Authority (FINRA) will likely require arbitration as specified in FINRA’s regulations. However, FINRA has adopted a rule regarding Financial Exploitation of Specified Adults (Rule 2165) which will allow members to place temporary holds on disbursements of funds or securities where there is a reasonable belief of financial exploitation of those customers. This rule will become effective on February 5, 2018. Also, amendments to the rule regarding Customer Account Information (Rule 4512) now require members to make reasonable efforts to obtain the name and contact information for a trusted contact person for a customer’s account, in order to reduce the danger of abuse. Actions regarding trusts and estates in California are litigated in the state’s probate courts. Such actions do not allow jury trials. As elder investment fraud cases are on the rise, attorneys with elder law practices in California will likely want to be prepared. Our elder law expert contributors were kind enough to share some of their top tips for successful litigations. “Both physical and financial elder abuse cases must be handled quickly and efficiently. In some states (such as California) seniors may be entitled to trial preference. This is a very important tool – in California, you can get a trial 120 days after trial preference is granted. This is important for seniors who need prompt resolutions because they have lost much or all of their retirement funds to a scam. A successful litigation strategy should begin with a detailed timeline to help litigators understand and tell the story of the case. This sentiment is echoed by Dr. Wood in her article, “How to Construct Winning Undue Influence Cases.” Mr. Hackard continued, the timeline should generally begin just before the time of the first instance of abuse. The timeline should track the victim’s age, vulnerability to undue influence, assets, and actions taken by the victim and/or others. The timeline should take particular note of actions and/or events that concern changes in ownership or use of assets. It is also important to track the mental and physical health of the victim. Litigators can use a complete timeline as a quick-reference in framing their litigation. Successful cases are exceptionally gratifying, plus they can help avoid other seniors from being victimized. “We have had several cases where we were able to unwind financial fraud that stripped the equity from a senior’s home; it is always a happy day when we are able to keep a senior in their house. Civil financial fraud cases can also lead to criminal investigations and convictions – helping to ensure that the scam artist does not victimize more people,” Murphy said. Our contributors provided a number of simple, but effective ways that elders can prevent becoming victims of investment fraud. Checking-in for 10-15 minutes every month to review financial documents can help spot issues before they become big problems. Dr. Wood has conducted extensive research with Dr. Marian Liu on the role of social support in elder financial exploitation. Dr. Liu’s paper, published in by The Gerontological Society of America examines the relationship between financial exploitation and distinct components of social support. The NTVCC works closely with 400-500 victims of investment fraud each year in seeking redress and/or filing complaints and “we’ve never met anyone who has made money from an investment offered through a ‘cold call’,” said Kleinman. It’s a simple suggestion, but simply hanging up the phone is perhaps the best prevention against investment fraud elders can take. Gary Mottola, Research Director at the FINRA Investor Education Foundation, believes “a core problem with the current state of elder investment fraud prevention efforts is a gap in the need for education on this topic and the somewhat limited supply of resources and organizations available to deliver this education.” Mottola spoke positively about the use of fraud prevention programs at FINRA Foundation’s SaveAndInvest.org website to reduce vulnerability to fraud among seniors. With investment scams on the rise, their propensity to quickly change in form and more seniors making their own investment decisions, the time is now to increase awareness. For Kleinman, “the best reporting channels are… anyone that will listen, and even those who don’t. We know consumers under report victimization, so the more we can get people speaking out, the better our chances of getting additional resources to address the issues. See Securities Exchange Act Release No. 79964 (Feb. 3, 2017), 82 FR 10059 (Feb. 9, 2017) (Notice of Filing of Partial Amendment No. 1 and Order Granting Accelerated Approval of File No. SR- FINRA-2016-039) (Approval Order). Professor, Psychology; Licensed Clinical Psychologist, CA.